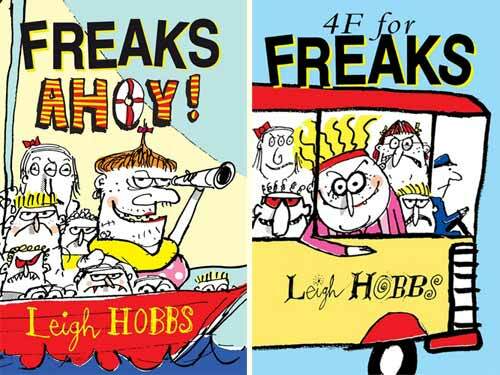 Children’s author and artist Leigh Hobbs is the Australian Children’s Laureate for 2016-2017. Leigh described his appointment in February as ‘a lovely thing for me because my books are on the subversive side, and also I think humorous books have been underestimated’ – in fact, the hilarious though gentle subversion created by the contrast between his words and illustrations is of particular attraction to his readers. There can be no doubt that this aspect of his work will make his laureateship especially exciting for children, and possibly a bit of a roller-coaster ride for adults! Leigh grew up in the town of Bairnsdale, some 300km east of Melbourne, where he was born, and he now lives in Williamstown, Melbourne. 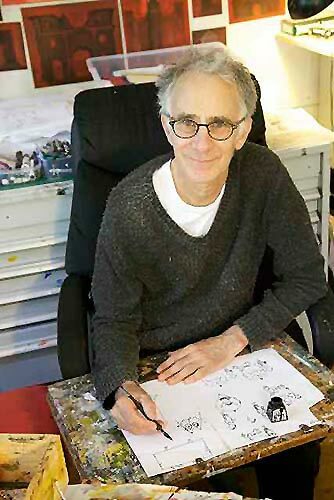 His distinctive style of illustration has embraced both fiction and non-fiction written by other authors, but he now devotes his time to his own stories, which encompass a cast of such unique and instantly identifiable characters as Old Tom, Horrible Harriet, Fiona the Pig, the Freaks in 4F, Mr Badger and Mr Chicken. 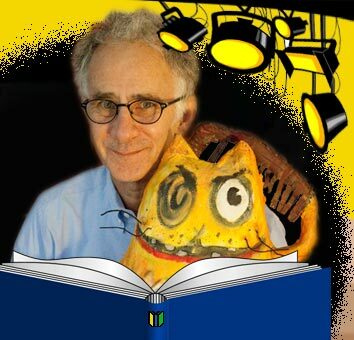 His books are hugely popular in both his native Australia (in fact, his books have won every major children’s choice award there) and the UK, where he spends a great deal of his many trips entertaining and inspiring children during school visits. Welcome to MWD, Leigh. 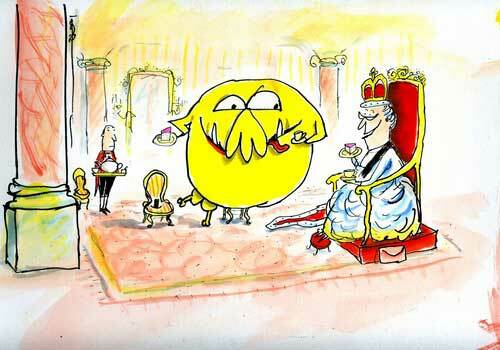 First of all, many congratulations on your appointment as Children’s Laureate in Australia. I know the announcement was greeted with great approbation among your colleagues. What do you hope to accomplish in the next two years as Children’s Laureate? Are there any particular issues or themes you intend to address? 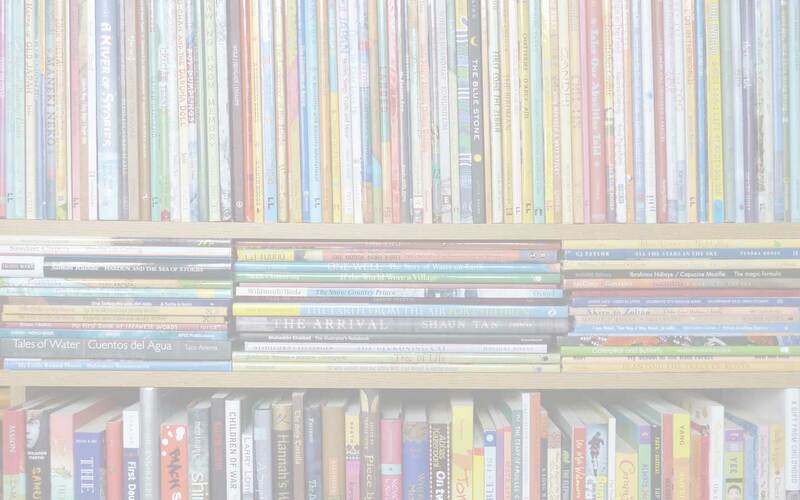 One of the criteria for being appointed Children’s Laureate is that you be ‘willing to promote the transformational power, value and importance of reading and the importance of children’s and youth literature in Australia’s literary culture.’ What is your vision for reaching all children in Australia? As the Australian Children’s Laureate, during my two-year term I’ll be visiting every state in Australia at least once as an advocate for the power, value and importance of reading. I’ll be running workshops and doing presentations for and to adults on visual literacy, the power of picture books and creating characters in ‘words and pictures’. 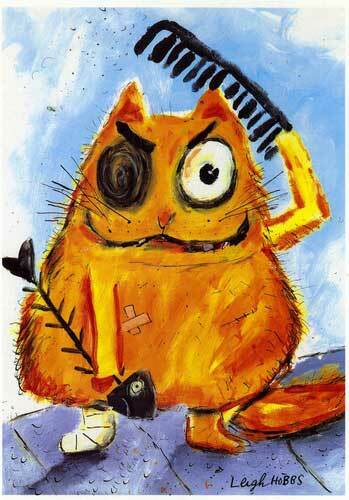 And for the kids I will be running workshops with the theme of creating your own characters…in words and pictures. I was a secondary art teacher for twenty five years, so my teaching survival skills are quite honed. I love that that when you were a child, your father gave you an alarm clock and you weren’t allowed to get up until after it had gone off… Has that ever changed and do you jump straight into creative mode when you wake up? Yes. 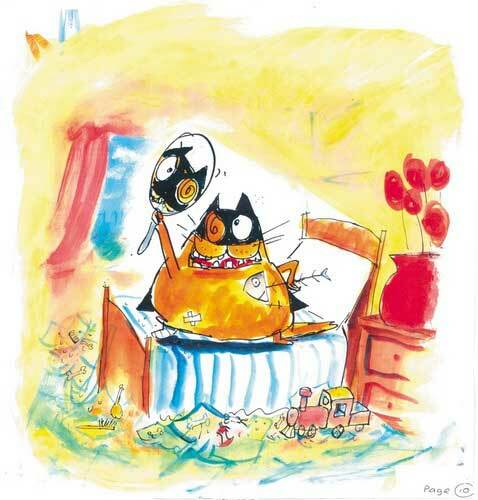 I leap out of bed ready for the day which, as soon as possible means being at my desk, scratching away in pen and ink. There’s often quite a bit of fiddling around beforehand, but the brain is ticking over as soon as I wake up. I’ve always found it more difficult to relax and sleep than to work. Well, my preferred work, as in ‘art’. How do you like to work – are you very methodical? Work-wise I’m methodical but I suppose in an idiosyncratic way. 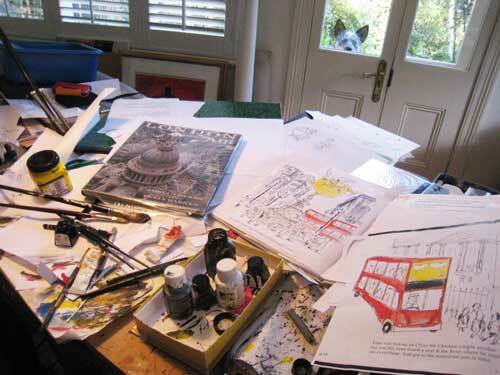 My studio looks chaotic and messy, but there is an order of course in the way I create the books. I do spend a lot of time searching for stuff mislaid under mountains of paper, books, paint and brushes. I focus on one project in the initial ‘inspired and enthusiastic’ stage when the ideas are flowing freely, but inevitably I hit a rough, dry spot and then I work on a few things at once. You spend quite a bit of time in England each year and visit many schools. Can you share some highlights with us? 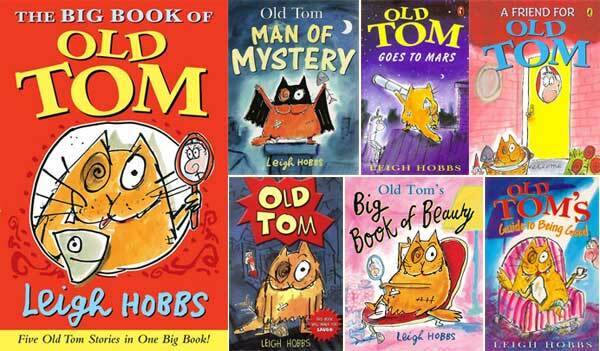 Some years back, on my first school visit in London, I remember a moment when about sixty little year-one students were drawing Old Tom, carefully following my instructions. I realised that from when I was their age – they were about 6 years old – my dream was to ‘be an artist and come to London’. Now, all those years later here I was and these children were drawing one of my beserk creations. Do you carry a sketch book with you when you are away? I seldom carry a sketchbook when I’m away, well not around the streets as I couldn’t draw in public. Anyway I’m too absorbed either walking or looking. Though there have been exceptions when I’m in a place which I’m doing a book about at the time. For instance, Mr Chicken in Paris / London / Rome. But usually I do detailed drawings back in the hotel room. 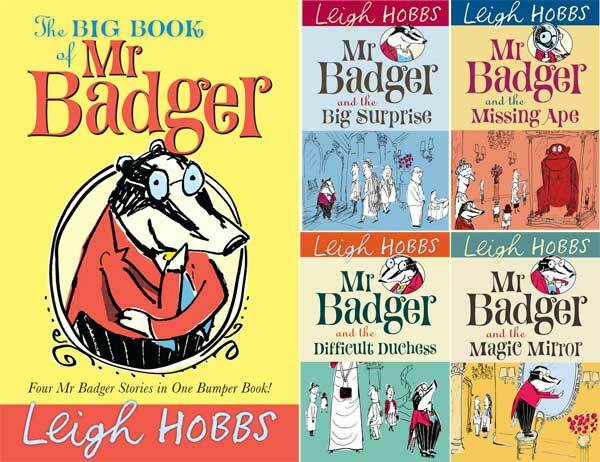 Your Mr Badger books play to quite a few English stereotypes. I don’t say that as a negative criticism because, as well as their humour, I think the volumes of affection that the books exude, as well as their quirkiness, make them very appealing – but I do find it intriguing, in a way, that you get away with it! How do children in England and indeed Australia react to them? 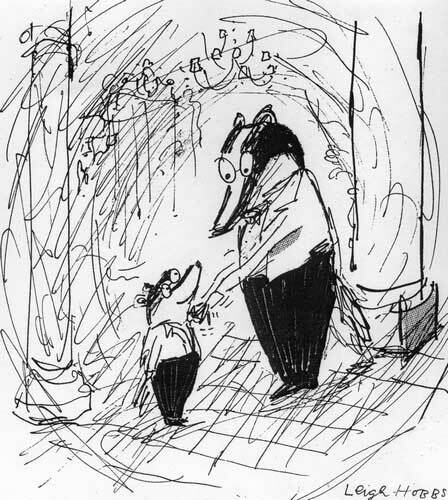 I suspect that my so called ‘playing to stereotypes’ in the Mr Badger books doesn’t cause offence because all of the characters (even the irritating Sylvia Smothers-Carruthers) are etched in a humorous and affectionate way. I like all of my characters good and bad, if you know what I mean. None is entirely monstrous. Children in Australia seem to love the Mr Badger books. 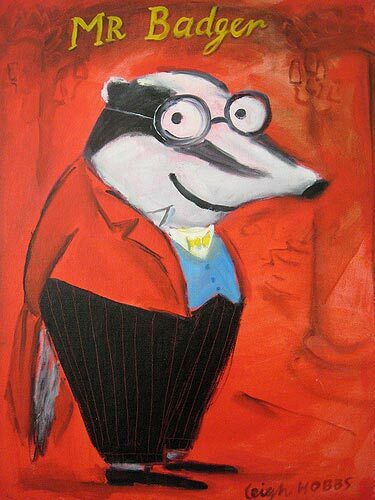 In fact Mr Badger came into being because an English editor whom I know here and I were having afternoon tea in Claridges and she suggested that seeing I loved London so much, ‘why don’t I create an English character?’ Prompted by champagne and scones I described him and where he lived almost immediately; he was created on the spot. All the raw material for his ‘world’ was already in my head, thanks to hundreds of walks around London. I’ve been exploring London since 1976. 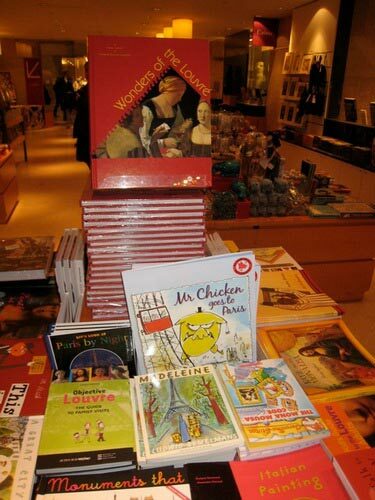 I can see Mr Chicken Goes to Paris and Mr Chicken Lands on London becoming favourite souvenirs of young visitors to the cities – and I’m glad to see they are also translated into French, though I note that the French edition of Mister Poulet visite Paris shows Mr Chicken with a huge grin on his face! Were you asked to make any other changes? 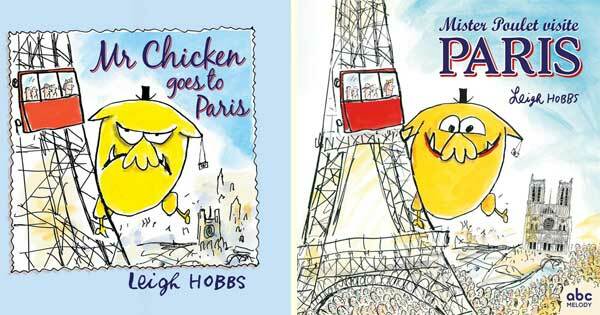 For the French edition of Mr Chicken Goes To Paris, yes, I was asked by the publisher to change Mr Chicken’s face to make him look friendly, as French bookshops reckoned he was ugly and scary. I thought their reaction odd as kids love his mad grumpy face, and the Bloomsbury English edition of that title with the original grumpy face, available in the Louvre Bookshop has sold in the thousands – probably to tourists. Anyhow, I did a new friendly face on the cover. I still prefer the grumpy original. I wasn’t asked to make any more changes. Just as well. You talked last year at the Melbourne Writers Festival about Mr Chicken being ‘on the loose’ and I’m very excited to hear he’s visiting Rome next. Can you tell us something about his visit? 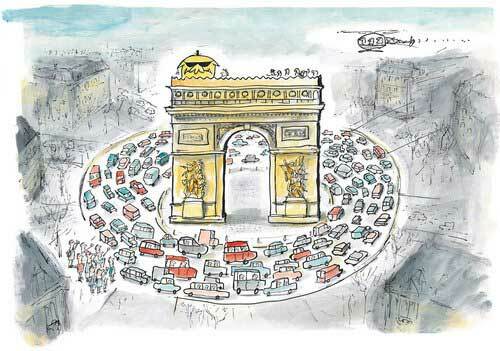 ‘Mr Chicken arriva a Roma’ is being published by my Australian publisher Allen and Unwin. Last year I went to Rome for eleven days and filled a sketchbook with drawings – yes, I did carry one around! I sketched Mr Chicken on a Vespa, eating gelato and pasta – visiting the Colosseum – admiring the Pantheon – driving a chariot – relaxing in The Trevi Fountain etc. etc. I think Rome is a marvellous place so it wasn’t hard to have Mr Chicken enjoying himself there. 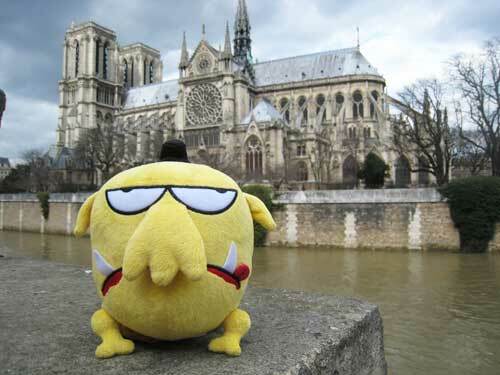 Hopefully readers will pick up on my and Mr Chicken’s affection for and wonder at this fantastic city. I loved the Gelato especially. 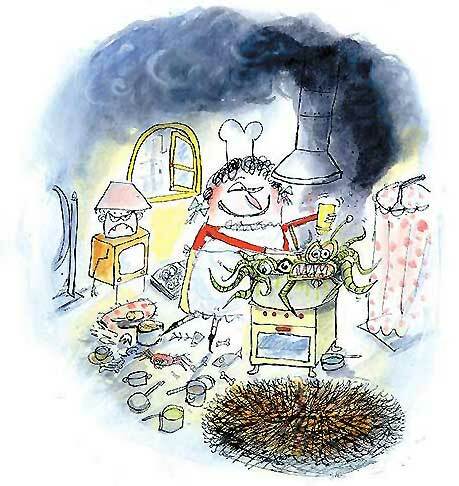 Do you put yourself into your children’s books – I ask, because I am wondering if Mr Chicken is your alter ego? 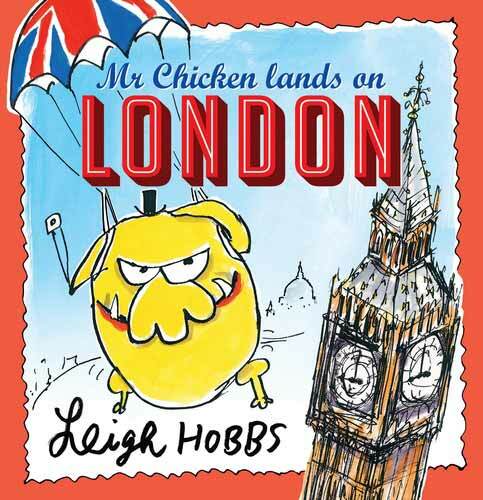 The book with the most obvious connection to me is Mr Chicken Lands on London. With the exception of breakfast with the Queen, just about everything else in that book is based on where I love to visit when I’m in London. 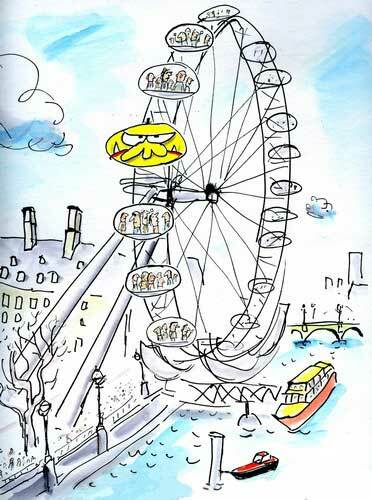 The London Eye isn’t of much interest but I couldn’t resist having Mr Chicken on it. That book is a love story. It’s about the love of a place. Mr Chicken has a chance, at 9:15 pm exactly, to be or feel part of the fabric of London, when his face merges into the clock tower holding Big Ben. A lot of the humour in your books lies in the way the pictures subvert the text and the way bland normality of tone clashes with far-fetched flights of the imagination. 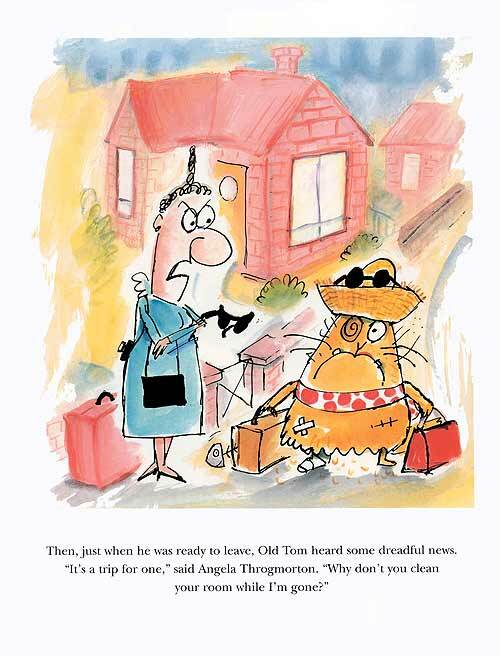 The matter-of-factness in the text (so beautifully tuned in the relationship between Old Tom and Angela Throgmorton, for example, or in Horrible Harriet’s high opinion of herself) offers children a safety net that means they can immerse themselves in the subversive humour. You have also worked a great deal within the realms of satire, both as a political cartoonist and a sculptor. Do you consciously work to different agendas and how aware are you of boundaries in your work? I have no agenda when I work, other than to push myself with text and artwork as far as I feel I can, toward that thing in one’s head that says, ‘It’s right’. And of course, it’s seldom exactly ‘right’. I’ve never been a politically motivated person and certainly not a political cartoonist. I feel very strongly about certain issues but choose—or rather, I’m not moved—to make my books a vehicle for those issues. I don’t for a start have the grasp of or interest in politics. I am motivated by character. I love sketching a character in words and pictures. I find it easy to empathise with people and maybe this is something that kids respond to in regard to the characters I’ve created. Despite the apparent ghastliness of some of your characters (4F for Freaks springs to mind), there is actually a lot of love. Where does your empathy for the underdog come from? In spite of my various book characters appearing bolshie, I’m a softy at heart! I was a skinny, shy boy, hopeless at sport and ‘adding up’, but I was always good at art at school and fortunately never bullied: but I saw it happen to others and it registered. 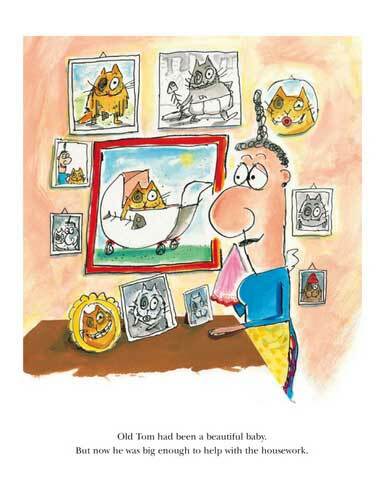 Regarding Old Tom, I think it’s the underlying affection between Angela and Old Tom which appeals to kids as much as Old Tom’s naughty ‘funnyness’. Theirs is another kind of love story. The love of a mother for her son. You taught art for a number of years in a secondary school, yet your books are aimed at a younger audience. Australia is at the forefront of producing fine picture books for older readers. Have you ever thought about creating a book for young adults? 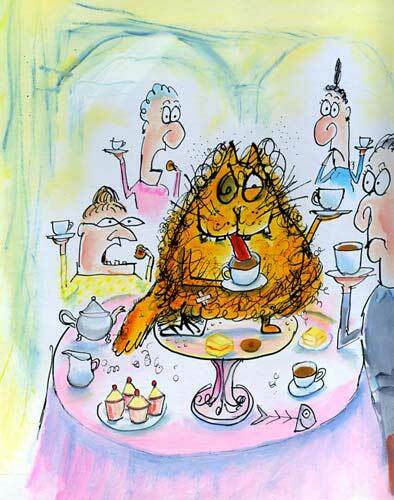 My picture books have found their own audience which includes appreciative adults. I have no interest in producing books different to what I do now so as to appeal to another audience. Children have an innate sense of humour, an innocent ‘eye’ and a willingness to follow the story wherever I may take them. I think of this as ‘kid logic’. Children rarely question Mr Chicken’s size as being ‘illogical’. However some Australian critics say he doesn’t look like a chicken. In fact I never say he’s a chicken. Quite simply, this is what he’s called and this is how he looks. That seems to be all kids need for them to believe. Do you have any new books coming out soon and what, between all the busy-ness of your work as Children’s Laureate, are you working on at the moment? My next book is Mr Chicken arriva a Roma. It’ll be out in September. It’s almost finished. I suspect that I’ll not have time to start and finish another big project while I’m the Laureate. A Biography of Samuel Pepys. Lying on a beach – and certainly, climbing a mountain is my idea of hell not a holiday! 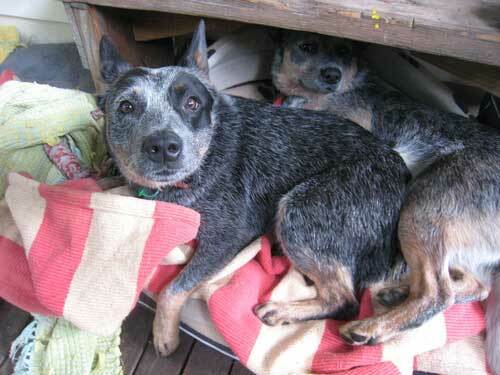 My two Blue Heeler dogs. I went to Vienna a few years ago to see the fantastic 18th-century State Library because I’d seen it in a book about Baroque Architecture. Nothing about me would surprise my friends. Today’s work entails honing the text of Mr Chicken arriva a Roma. Though I’m in London, so I think I’ll forget it and go to a favourite spot…The National Portrait Gallery. 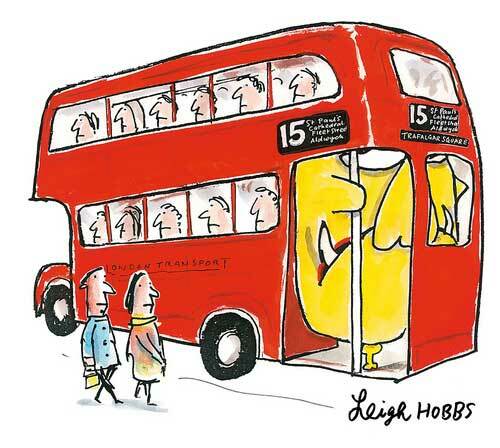 All illustrations are reproduced here by permission and are ©Leigh Hobbs; they may not be reproduced without permission. Allen & Unwin (Australia), children's books from and/or set in Australia, Children's Laureate - Australia, Horrible Harriet, Leigh Hobbs, Mister Chicken arriva a Roma, Mister Chicken visite Paris, Mr Chicken Flies to Rome, Mr Chicken Goes to Paris, Mr Chicken Lands on London, MWD interview, Old Tom. Bookmark. Fantastic interview! My younger sister has lived in Australia for 36 years, and often sent Australian books to my kids when they were young. I always loved the quirkiness and originality of these stories. Obviously, Leigh measures up (and more) to my resulting expectation that Aussie kids’ books have a real kick to them! 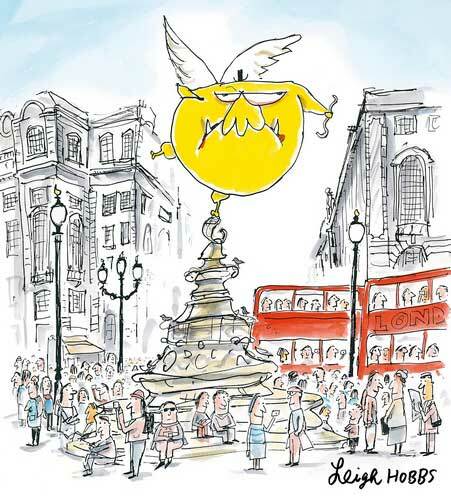 As for the “children’s laureate” concept: what a fabulous idea! So glad you enjoyed ‘meeting’ Leigh, Dorothea – and how lucky your kids were to have books arriving from Australia! Check out Leigh's fabulous introduction to Australia via picture books, 'A love and feel for place' (The Guardian). Look Behind the Studio Door with Books Illustrated.